Please email me any questions, thoughts or suggestions to zach@wing.vc or message me on Twitter @zacharydewitt. Wing is a $460mm early-stage VC fund founded by ex-Sequoia and Accel partners. For this exercise and for the results below, we removed everyone from the survey who reported that they do not directly work in the crypto industry. For example, this could be someone who works at a traditional hedge fund who is very knowledgeable about crypto and who is personally invested in crypto, but the hedge fund that she works for is not fully dedicated to crypto. Consequently, n = 82 decreased to n = 58, but all of the below results are from people directly employed in the crypto industry. 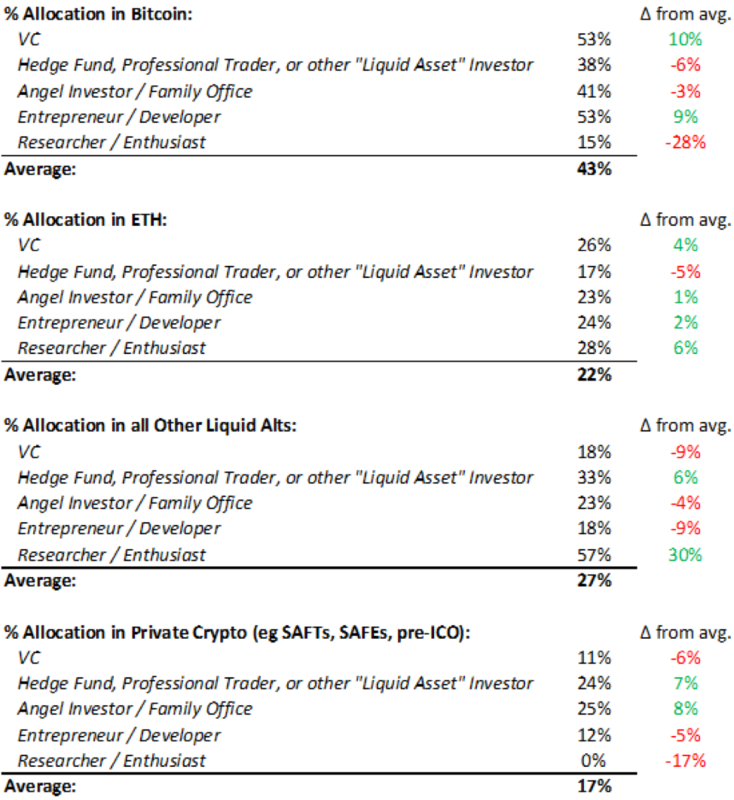 From the data above, it is interesting to note that crypto hedge funds own relatively less BTC (38%) and ETH (17%) than other crypto investors and are instead, more weighted towards other liquid alts + private crypto investments. Furthermore, entrepreneurs and developers have a relatively high allocation to BTC (53%) and the relatively average allocation to ETH (24%). Hedge funds, angel investors and family offices are most bullish in the near-term (2018). They are also relatively more bullish than VCs on where the price of BTC will be in 2022. There are a handful of interesting observations, despite the limited size of the survey (remember, n = 58). Observation #1: Crypto hedge funds are the most bullish on the crypto market (both in predicting a ~2x total market cap improvement by end of 2018 and in predicting a ~20x improvement in BTC’s price by 2022), but are allocating a relatively larger portion of their current holdings away from BTC and ETH and towards other liquid alts + private crypto deals. Observation #2: Entrepreneurs and developers hold a relatively high amount of BTC (53%) and an average amount of ETH (24%). Observation #3: Crypto-focused VCs hold the relatively highest allocation of BTC (53%), despite being relatively more conservative on BTC’s 2022 price (crypto VCs are predicting BTC multiplies~8x in price per token vs. crypto hedge funds predicting BTC multiples~20x).